September is a good time to start fresh, make goals, and dive in. Due to the theme of National Sewing month, as well as a blog tour being sponsored by Moda (http://blog.modafabrics.com/2014/09/moda-designer-blog-tour/), I have read many posts by bloggers describing when they received their first sewing machine, when did they start quilting, what is their favorite part of the process, etc. So, I thought I would restart this blog by telling you a bit of my sewing story. I have been sewing since I was 10 years old. My mother and two aunts were my teachers. My first project was a skirt with an elastic waistband and a matching vest. I made a practice version (I never heard of the term ‘sloppy copy’ until I was a 4-H mom), in a grey denim and the vest was lined with a blue striped shirting. The second version, the ‘real outfit’, was made with a golden orange pumpkin colored corduroy; the vest lining was a cream with an orange print (don’t laugh — it was the early 70’s). I wore both versions very proudly to school on a regular basis. My parents gave me a Kenmore sewing machine for my 13th birthday. I used that machine until my early 40’s, when I bought my Bernina. I taught my daughter how to sew on the Kenmore, and even my son made one 4-H quilt on it. That machine made two prom dresses, countless skirts, dresses, tops, bathrobes, bathing suits, and one fateful pair of pants (have never liked making pants since). It went to college with me, my two apartments, and my first home. 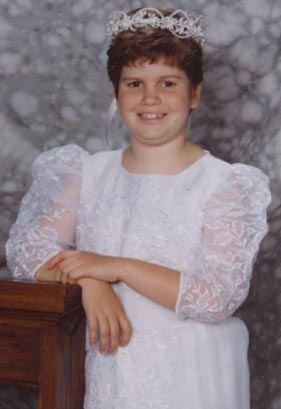 The last big project sewn on the Kenmore was to reconfigure my wedding dress into a first communion dress. As an adult, my sewing was focused on items for my home or my children, and due to the constant juggle of being a wife, mother, and having a full time job, many of those projects were made under tight timelines resulting in high levels of stress. My first two quilts were group projects. The first was a sampler, applique quilt, that my mom designed in the early 70’s. She was the leader of the arts and crafts group for a girls organization that was sponsored by Ozaukee County, Wisconsin. The other girls and I appliqued the blocks that my mom had designed and then we hand quilted it on a huge frame. I think the quilt was donated to the club to raise money. Years later, in the early 90’s, I led a group of friends from the Kalamazoo Junior Woman’s Club to create an applique quilt that I had designed. That quilt was also auctioned off to raise money to support the club’s chosen charities. 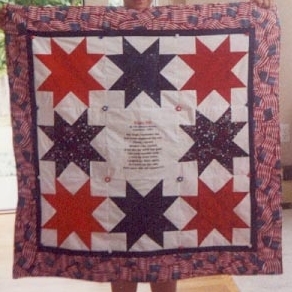 My mom and I became interested in quilting again in the early 90’s, when the craft made a resurgence. The first quilt pattern that spoke to me was a log cabin. My breath still catches when I see one, and one of these days, I will make one. I made a few quilts over the years, a baby quilt for my son, a strip quilt for a Christmas gift for my parents, but my main focus was teaching my daughter and others to quilt through our 4-H program. During my daughter’s 9 year tenure in 4-H, she made 8 quilting projects, two of which were judged to be champion quilts at the county fair. Earlier this year, I resigned from my job and brought to a close a 28 year career. One of my goals is to spend more time doing what I love, and top of the list is quilting and sewing. This blog is part of that new direction, because as I brush off my skills and rediscover my passion, I would like to share that process with others. I hope you join me…. I have a goal — to transition from chaos to calm, and in doing so devote more time to my passion for quilting. I started a blog in January (http://beingcarefree.com), in which I focus on this transition, and when I am farther along, this site will provide a place to blog just about my quilts. Until, then, please join me at my other blog.